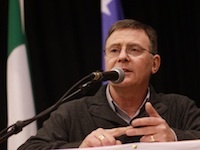 Below is the text of an oration delivered by eirigi chairperson Breandan Mac Cionnaith at a commemoration for Jim Lynagh and Padraig McKearney on 15 May 2011 at Drumfurrer, County Monaghan. A chairde agus a chomradaithe, go raibh maith agaibh as an chuireadh le bheith anseo libhse inniu chun omos and onora a thabhairt do bheirt oglach chroga a fuair bas ar son saoirse na h-Eireann. As we gather here to remember Jim Lynagh and Padraig McKearney, we also remember their comrades - Paddy Kelly; Declan Arthurs; Gerard O’Callaghan; Eugene Kelly; Seamus Donnelly and Tony Gormley - all of whom who died at the hands of British crown forces in a well-planned and pre-prepared ambush at Loughgall on May 8th in 1987. Anthony Hughes, a civilian who drove into the British kill-zone that evening also died. This well-maintained memorial, dedicated to Jim and Padraig, gives expression to the esteem in which these men continue to be held. The struggle taken up by James Connolly, Tom Clarke, Constance Markievicz and their comrades in 1916 was carried on by Republicans of the highest calibre such as Liam Mellowes and Joe McKelvey, like Sean McCaughey in the 40’s, through to Michael Gaughan and Frank Stagg in the 70’s. It was the same struggle carried on by Jim, Padraig and many other courageous men and women. They could have ignored the injustice they saw around them and, instead, have chosen to have lived quiet lives. But their desire for freedom and justice in Ireland was such that they committed themselves fully to the Republican cause. This year also marks the thirtieth anniversary of the 1981 hunger-strike which resulted in the deaths of Bobby Sands, Francis Hughes, Ray McCreesh, Patsy O’Hara, Joe McDonnell, Martin Hurson, Kevin Lynch, Kieran Doherty, Tom McIlwee and Micky Devine in the H-Blocks of Long Kesh. Bobby, Francis, Raymond and Patsy all died during the month of May. It is right that we remember them and all those who died in the freedom struggle at commemorations such as this and that we also rededicate ourselves into that same struggle for an Irish Republic. It is also right that we extend our support and solidarity to those Republican prisoners on protest in Maghaberry gaol. Today is a time for each of us to remember two men, Jim Lynagh and Padraig McKearney, who have given their lives in pursuit of our republican ideals and goals; two men who were close friends and comrades to some of you gathered here. It is a time to remember the sacrifices endured by their families. It is also a time for reflecting on the ideals which motivated Jim and Padraig. Republicans often recall the words of the 1916 Proclamation - an historic document - one of the most progressive documents of its time. That is a legacy of 1916 which is seldom mentioned - it is a legacy which all Republicans, socialists and other progressives would do well to remember, commemorate and to emulate in coming years. The teachings of James Connolly are as relevant today as when he was alive. His socialism is ageless and as Republicans, as socialists, we must strive to ensure that the relevance of his political teachings is kept alive in Ireland today and in the future. Connolly would never have accepted the dictum from any political party that “labour must wait”. The Irish working class, the men and women of no property who for generations have been the backbone of the republican struggle, have been waiting in vain for too many years. The total unemployed across the 32 counties is heading towards 600,000, many thousands of others who are employed are facing wage-cuts and are hanging on to their jobs and their family homes by their very fingertips. Thousands of our young people are again being forced abroad as economic migrants. It goes without saying what the position of Connolly would have been on present day trade union leaders who fail their members day and daily in this country at a time when capitalism is in crisis and when the working class, the unemployed, the ill, the elderly and the young are under attack across the whole island. It also goes without saying what the position of Connolly would have been to those political parties who claim to espouse working class and republican teachings but who endorse partition and who spend their time knocking on the doors of the right-wing establishment parties seeking coalition government. He knew only too well that partition would lead to a carnival of reaction, and that carnival of reaction has been in full flow in recent years. Ireland remains divided by imperialism. The livelihoods of the vast majority of Irish people are controlled by undemocratic capitalist forces which stretch from this island to London, to Washington and Brussels. They are no different to those same undemocratic controlling forces which the Citizens Army together with the Irish Volunteers and other progressive forces mobilised against almost a century ago. They are no different to the same undemocratic controlling forces which Jim, Padraig and their comrades mobilised against during their life-times. Today, those undemocratic forces, are supported, both North and South, by a pliant, subservient and self-serving political class. The extent of that subservience can be seen clearly in the manner of their meekness to the dictates of the EU/IMF. It can be seen in the giveaway of our natural resources - the profits from which are destined to line the pockets of Shell, Statoil and BP, not too forget the pockets of our own modern-day William Martin Murphy: Tony O’Reilly. Instead those resources could and should be nationalised for the benefit of all the people. The extent of that subservience by the political class can be seen in the fawning welcome being given to the visit by the honorary head of the British armed forces while Britain maintains its grip on the Six Counties and engages in war elsewhere in the world. And on that point, comrades, I would strongly urge each of you to make your way to Dublin and elsewhere this week to join in the various protests that are being organised against this visit. The subservience of the modern political class can be seen in their daily collaboration with Britain, in their lack of active opposition to repressive and draconian British laws as they endorse and support a British police force, and their lack of opposition to Britain’s deployment of its troops “in mufti” throughout the Six Counties. I have stated publicly before and I will re-iterate it again today - Those who support and endorse the structures of partition have placed themselves firmly in the camp of the counter-revolution. We must be prepared to confront and to challenge that propaganda campaign both north and south. We must again educate others into the nature of our struggle; that our struggle is not based on a narrow-minded nationalism; it is about achieving real political freedom, it is about delivering social justice, it is about economic equality for all. While we are gathered here to pay tribute to fallen comrades, let me make it clear that I do not pretend, or presume to know, what the thoughts or attitudes of Jim and Padraig would be on the present situation, or indeed, on any of the developments which have impacted upon our struggle over the last number of years. There are others present here who knew Jim and Padraig well, both as close friends and as close comrades, and who are better placed than me to do so. However, there is one fact that I can state with certainty. The objectives to which Jim, Padraig and many others pledged their allegiance; the objectives for which they gave their lives are the same objectives which were clearly and unmistakably enunciated through the IRB Proclamation of 1867, the 1916 Proclamation and the Democratic Programme of 1919. Comrades, those objectives have not been achieved. Settling for anything less than the complete achievement of those Republican objectives was never an option for those whom we remember and honour today. The business of establishing a free, sovereign and independent Irish Republic remains unfinished. Even the most cursory reading of those three documents reveals that the goals and objectives of those who fought, were imprisoned and who were executed are far from complete. While today we commemorate the 24th anniversary of the state executions of Jim, Padraig and their comrades, more importantly we must commit ourselves to continue the struggle for a democratic, independent, and sovereign Irish Republic. An Ireland whose total resources will come under the control of the ordinary working people of this island regardless of gender, religion or race - a truly free Ireland. That is our objective. To settle for anything else dishonours the vision of those we commemorate today. Many previous generations of Republicans experienced dark and dispiriting times. They, too, experienced betrayal, division and defeat of the Republican cause. They responded by re-engaging in various facets of the struggle, by re-organising and by building new networks and new alliances with other progressive and radical forces in order to try and bring about revolutionary change. We must do likewise. But we must also be realistic. Republicanism is once again divided and maintaining that division is central to the strategies of the enemies of radical Irish Republicanism. We must seek to overcome that division. In attempting to do so, we can learn from and adapt the experiences of others. When we look at those who have inspired us individually and who have inspired us, collectively, as Republicans, we find that they all have certain things in common. It matters little if those who inspired us were part of our own struggle, like Jim or Padraig, James Connolly or Tom Clarke; it matters little whether they were part of other struggles in Europe, Africa, Asia, or Latin America. The people who inspire us as Republicans all had an unquenchable desire for justice and freedom; they all shared a deep love and appreciation of humanity; they all had a willingness to step forward and be in the forefront of struggle no matter where it was and no matter what danger they brought upon themselves. Those who inspired us also shared another common feature from which we must learn. We must learn from their ability to analyse, their ability and willingness to identify and to organise against the guilty in society no matter how great or how powerful. But above all else, we must learn that these people offered practical solutions in extremely difficult times; solutions that made sense to the working man and woman, the tenant, the landless labourer, to the small farmer, to the oppressed and the exploited. And because they offered solutions which made sense, they provided hope, inspiration and leadership and built their movements from that solid basis. We must therefore also learn that it is not enough to analyse, it is not enough to criticise - we too must provide viable alternatives to the status quo and bring forward solutions which will make sense and will offer hope and inspiration to others. That is the task before us today, tomorrow and every day after that. It is not an easy one, nor are there any quick fixes. The task for each of us is to help build a new Republican and revolutionary potential to drive that vision of a new Irish Republic forward and to re-awaken the inherent desire for true political, social and economic freedom and justice that exists among all people, young and old alike, in our villages, towns and cities, in our workplaces, in every one of our communities. Pearse, Connolly and their comrades were soon to prove such thinking to be completely wrong. Today, a similar thinking and assessment of Republicanism pervades the mindset of the British government. It is the same mindset which exists in the establishment parties of both the Six and Twenty Six Counties. It is the mindset which exists among those who have accepted a two state partitionist settlement and who seek to demonise and criminalise those of us who oppose partition and the corrupt, unjust political, economic and social systems which partition has spawned. As we leave here today, comrades, let us go armed with the firm intention of proving such thinking by Britain and her collaborators in Ireland to be completely wrong again. Let us remember Jim and Padraig, our fallen comrades and our friends with pride, not for the sake of remembrance only, but so that their example will encourage us all to continue to struggle onwards to achieve their vision of a free, and truly independent, 32 county Irish Socialist Republic. Beirigi bua, comrades. Ar aghaidh linn le cheile.